The CRM software solution designed specifically for Yacht Brokers. YBroker is a complete yacht brokerage software package that runs on your computers at your office, keeping details of clients, boats and sales, as well as managing communication with the buyer and seller. View boats for sale from our registered yacht brokers and independant vendors. Purchasing the Yacht Broker Software YBroker will allow you to advertise your boats for sale on this site as part of your licence. Easily manage your boat listings and images. Match your purchasers to your boat listings. Email boat details directly from YBroker. Print boat adverts and boat details. 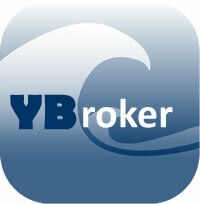 Upload boats and their pictures directly to the YBroker Network. For a small monthly fee we will advertise your boat on YBroker. You vessel will be listed in the Boats for Sale section, and any potential purchasers will contact you via a contact form on the YBroker website.